Confusion over the types of coal being burned in Chinese power stations has caused a significant overestimation of the country's carbon emissions. Researchers, published in the journal Nature, say existing CO2 calculations had used a globally averaged formula. But when scientists tested the types of coal actually being burned in China, they found they produced 40% less carbon than had been assumed. The study says the error amounted to 10% of global emissions in 2013. China's drive for economic growth over the past 15 years has seen the rapid expansion of coal burning for the production of energy. That rate of expansion has fallen away but this reliance on coal means that China's emissions of carbon dioxide topped the rest of the world for the first time back in 2007, a position it has retained ever since. China routinely publishes energy statistics but it doesn't produce regular information on carbon emissions. International organisations try to work out accurate CO2 estimations using the energy data and established "emissions factors", which detail the amount of carbon produced by the fuel being burned. These factors, provided by the Intergovernmental Panel on Climate Change (IPCC), are usually averages based on assumptions about the type of coal being used. This allows global comparisons to be made. However, this new study looked at the actual carbon content found in over 4,000 coal mines in China and in lab tests of 602 coal samples. The emission factors based on these tests were on average about 40% lower than the default values used by the IPCC and others. 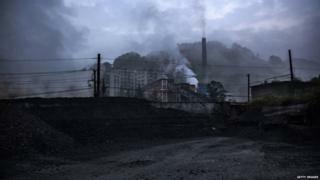 "For most of the developed countries, coal has been comprehensively washed but in China the process is not so comprehensive," lead author Dr Zhu Liu from Harvard University told BBC News. "Basically, the coal contains higher ash; more ash means there is less carbon. If we convert the same amount of coal, we get fewer carbon emissions. That's why we get a lower level than previous estimations." The scientists say that China is effectively using more poor quality brown coal than previously assumed. This skews the emissions figures because it contains less carbon than higher grade bituminous coal. The researchers say the discrepancy is significant. Over the period 2000-2013, they found that China emitted almost three gigatonnes of carbon less than previous estimates, which is around 10% of the global total in any one year. "The findings do have very significant global implications as China accounts for one-third of global total emissions. If we reduce China's emissions by 15%, we get a 5% less global total," said Dr Zhu. "The IPCC emissions factor number needs a revision and that should be at the global level. " Other researchers disagree. They say that the new study, while giving greater accuracy about China, doesn't change the overall global total on emissions. "China's emissions may be a bit less than we thought, but we know how much total CO2 there is in the atmosphere and it is monitored globally," said Prof Dave Reay from the University of Edinburgh. "This study therefore makes no difference to the total amount in the atmosphere; it simply means that accounting for Chinese emissions is getting better." "China is one of the biggest coal users in the world. There are also others like India, Indonesia and South Africa that haven't a very robust system for collecting data and verifying the statistics," said Prof Dabo Guan, another author of the paper from the University of East Anglia. "There is huge, even greater uncertainty for India and Indonesia - this is a starting point for the global south."